The Odessa Catacombs are a labyrinth-like network of tunnels (subterranean cavities) located under the city of Odessa and its outskirts in Ukraine, that are mostly (over 90%) the result of stone mining, particularly coquina. The system of Odessa Catacombs consists of a network of basements, bunkers, drainage tunnels, storm drains as well as natural caves. The Catacombs are on three levels and reach a depth of 60 metres (200 ft) below sea level. It is one of the world's largest urban labyrinths, running up to 2,500 kilometres (1,600 mi). In the 19th-century, most houses in Odessa were built of limestone that was mined nearby. These mines were abandoned and later used, and widened, by local smugglers, creating a labyrinth of underground tunnels beneath Odessa. The approximate topography of the Odessa underground labyrinth is unknown as the catacombs have not been fully mapped. It is thought that most (95–97%) of the catacombs are former coquina multilevel mines from which stone was extracted to construct the city above. The remaining catacombs (3-5%) are either natural cavities or were excavated for other purposes such as sewerage. As of 2012, there are more than 1,000 known entrances to the tunnels. Only one small portion of the catacombs is open to the public, within the "Museum of Partisan Glory" in Nerubayskoye, north of Odessa. Other caves attract extreme tourists, who explore the tunnels despite the dangers involved. Such tours are not officially sanctioned because the catacombs have not been fully mapped and the tunnels themselves are unsafe. The first underground stone mines started to appear in the 19th century, while vigorous construction took place in Odessa. They were used as a source of cheap construction materials. Limestone was cut using saws, and mining became so intensive that by the second half of the 19th century, the extensive network of catacombs created many inconveniences to the city. Entrance of catacombs in Moldavanka on Kartamyshevskaya street. The entrances of the catacombs have to be closed or controlled at all times to prevent children from entering. 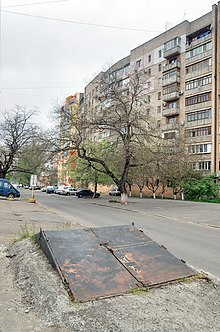 After the Russian Revolution of 1917, stone mining was banned within the central part of Odessa (inside the Porto-Franko zone, bounded by Old Port Franko and Panteleymonovskaya streets). During World War II the catacombs served as a hiding place for Soviet partisans, in particular the squad of Vladimir Molodtsov. In his work The Waves of The Black Sea, Valentin Kataev described the battle between Soviet partisans against the axis forces, underneath Odessa and its nearby suburb Usatove. In 1961 the "Search" (Poisk) club was created in order to explore the history of partisan movement among the catacombs. Since its creation, it has expanded understanding of the catacombs, and provided information to expand mapping of the tunnels. The city has a large population of over 1 million people, which some believe would benefit from the introduction of a subway system. The tunnels have been cited as the reason why such a subway system has never been built in Odessa. Since the beginning of the 21st century limestone mining has continued in the mines located in Dofinovka, Byldynka, and "Fomina balka" near Odessa. As the result of contemporary mining, the catacombs continue to expand. There have been various reports of people walking into the catacombs, getting lost and then eventually dying of dehydration. Perhaps the most famous story dates back to claims made in 2009 by Ukrainian catacombs explorer Eugene Lata. Lata wrote a widely circulated online post stating that he and other explorers had found the body of a local student named Masha, who on New Year's Eve in 2005 had wandered into the catacombs with her friends after drinking. The group of friends, he wrote, had all stayed there overnight, then left the next morning, but abandoned Masha, either accidentally or on purpose, and she was unable to find her way out. The post featured a graphic photo of what appeared to be a decaying corpse in the catacombs, which Lata claimed was Masha's body. A 2015 investigation by Vice writer Mike Pearl, however, found no evidence that Masha had existed. ^ a b c Bachynska, O. Odessa Catacombs (ОДЕСЬКІ КАТАКОМБИ). Encyclopedia of History of Ukraine. ^ Pearl, Mike (October 27, 2015). "The Enduring Legend of the Girl Who Died in Odessa's Catacombs". Vice. "Excursion to wild catacombs". Retrieved 2011-01-01. "The Odessa catacombs. Excursions to Odessa catacombs" (in Russian). Retrieved 2011-03-01. 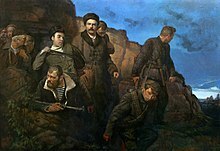 "The Odessa Catacombs". The World Odessit Club. Archived from the original on 2007-09-28. Retrieved 2006-09-23. This page was last edited on 4 April 2019, at 08:17 (UTC).